Students at Sunview Elementary recently raised $4,640 for the American Heart Association, as part of its Jump Rope for Heart program. The nationwide event is sponsored by the American Alliance for Physical Education, Health, Recreation and Dance Association. Physical Education teacher Ms. Heather Brzuski is a strong supporter of the program, as she has coordinated Jump Rope for Heart at Sunview for the past fourteen years, having successfully fundraised over $35,000 for the American Heart Association. Students at Sunview start the program at the beginning of each April with an exciting all-school assembly featuring the Sunview Jumpers, a year-long after-school jump rope program for 2nd and 3rd graders led by Ms. Brzuski, which uses jump rope to promote personal fitness and team-building skills. The Sunview Jumpers kicked-off this school year’s assembly with an impressive performance of jump rope routines they had tirelessly created and practiced both with a partner and as a team. Ms. Brzuski and other teachers also promoted the importance of living an active, healthy, tobacco free-lifestyle, and reinforced that message by jumping rope together as a fitting finale to the assembly. 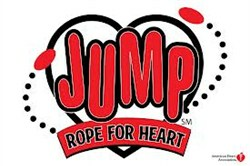 The Jump Rope for Heart theme for 2013 was “Be a Hero”, as students at Sunview learned how they could positively impact the lives of kids who don’t have healthy hearts like they do by raising awareness and funds. The fundraising part was accomplished by donating online at the American Heart Association’s website, or by asking for donations from family and friends. Students raised awareness by jumping rope during every physical education class during the month of April, achieving a combined total of 450 minutes or 7.5 hours! The Jump Rope for Heart program at Sunview featured a number of incentives for students, including entrance into the daily “Heart Hero Raffle” for any student who provided a donation during the first two weeks of the program. Eighteen students who fundraised over $100 were entered into the “PE Teacher of the Day” raffle. The four students who are selected will spend the day with Ms. Brzuski, assisting her with physical education classes, and enjoying a healthy lunch in the park, followed by some fun exercise! Congratulations to Ms. Brzuski and the students at Sunview Elementary for helping to make the Jump Rope for Heart program a shining success!